I colored outside of the box this weekend crocheting bracelets. I don't usually use bright colored seed beads. My color palette runs with matte metallics and earth tones. I wanted to show case Art Beads with bead crocheted. Last year I bought these color mixes from Whim Beads. The Ocean is called Fandango. I exchanged a green and added a blue for this combination. The Sand is a mix called Rainforest. I left it alone. It was just right. The Art Beads are disc beads made by my talented daughter and favorite bead artist Heather Powers of Humblebeads. 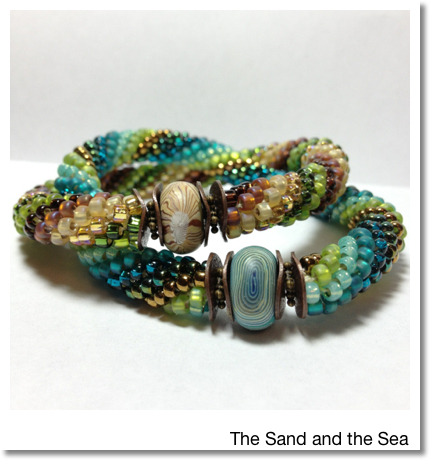 They were the perfect accent beads for the Sand and the Sea Bracelets. Stop by Humblebeads. Where you will find beads and inspiration to spark your creativity. nice looking bracelets, but the only way I knew they were yours was because you said so. Judith I still have a surprise or two left! Every now and than I color outside the lines and it works. I know I know your name from some group we've been in together perhaps? I loooove these designs. Gorgeous beadwork.